Top 10 quotes from one of sports all time champions…Muhammad Ali! know. Humble people, I’ve found, don’t get very far. in my hotel room and was in bed before the room was dark. 5. What keeps me going is goals. 4. It’s the repetition of affirmations that leads to belief. 3. I am the greatest, I said that even before I knew I was. 2. I hated every minute of training, but I said, “Don’t quit. world that I really was the greatest. Corporate Caricatures Drawn From Photos! Whiteboard Animation Colonoscopy – funny-comments that patients actually made! Cartoon whiteboard animation video illustrating actual funny comments patients made while having their colonoscopy. Cartoon doodle scribe showing a doctor doing a colonoscopy test and the patient is making funny comments. 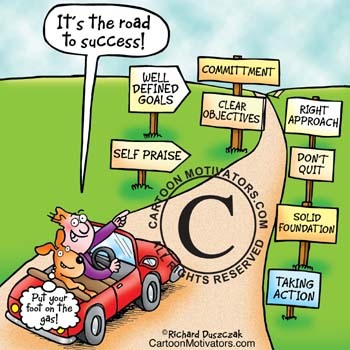 Motivational Cartoon – The Road To Success! The Road To Success – are YOU on it? Hi, here’s one of my favourite all time motivational cartoons and it seems to be very popular with others. It’s one of the most requested and reworked/reworded cartoons in my portfolio. Hope you like it and that it inspires you onto your goals!? Opportunities – You’ve Got To Grab Them By The Balls!